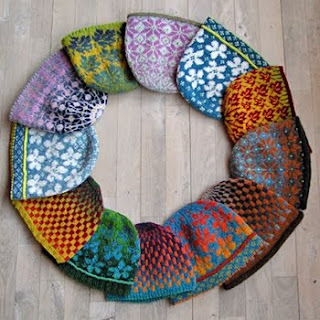 I checked my email just now, and found a Stitches West class confirmation, including a homework list. I don't remember being this excited about having homework before! This will be my fourth year attending Stitches and taking classes, but the first time I've recieved such an email. They must be getting even more organized. That brings me back to the next item on my finishing to-do list. 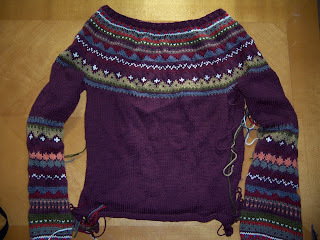 I knit the Equinox Yoke Pullover by Michele Rose Orne but I still need to weave in the many ends and seam it. So I guess I can say I've already done some stranded knitting, but I think I was in over my head. I feel stuck as far as the finishing work and I'm just hoping that my tension was even enough and that it will fit when I'm done. 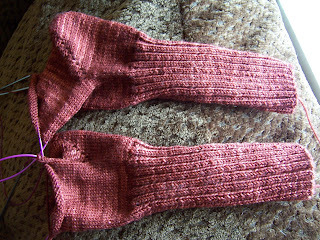 I'm growing attached to this pair, but the good thing about knitting a gift is that I can always make another one! You are rockin on that sock project! They are GORGEOUS. I still haven't even cast on for mine.....better get moving! Thanks for the motivation!